Unlike IMSA WeatherTech SportsCar Championship teams, attendance for Michelin Pilot Challenge teams was not mandatory at the Roar Before the 24. As a result, the entry list has increased from 40 teams to 49 for the race. The Grand Sport class has 35 entries, one of the largest for the class in recent memory. A couple of teams (CarBahn Motorsports, Park Place Motorsports and nolaSport) have cut back from two cars to one for the race, while others have increased their entries. One of those teams is eEuroparts.com ROWE Racing. At the Roar, they had one Audi R8 LMS GT4 for Tyler Cooke, Kenton Koch and Rodrigo Sales. For the race, Cooke and Koch will give commentators fits as teammates in the No. 2. Sales will move to the No. 8 with Gunnar Jeannette as his teammate. Multimatic Motorsports will be back with their development drivers. Ty Majeski and Cole Custer will be in the black and white No. 15, along with Scott Maxwell. Menawhile, Austin Cindric and Chase Briscoe will be in the No. 22. As previously reported, part-time Xfinity Series racer Kaz Grala will be in a second BimmerWorld Racing BMW with Aurora Straus. Bodymotion Racing has fleshed out their No. 31 Porsche. Pete McIntosh will be joined by Marc Miller (previously of CJ Wilson Racing and of Trans-Am) and Patrick Liddy. Miller returns to the series after spending 2018 racing in Trans-Am. Paul Nemschoff, who crashed the car at the Roar, will not be in the seat. PF Racing, which made their series debut at Road Atlanta in October, is back with Mustang. Patrick Gallagher is in the car along with Jade Buford and James Pesek. All three drove for the team in Pirelli World Challenge last year. Both Compass Racing and Motorsport in Action (MIA) are back with their McLaren 570S GT4s after skipping the Roar. The St. Eustache, Quebec-based MIA has Corey Fergus and Jesse Lazare back in the No. 69 for another full season. Compass Racing’s No. 75 has Paul Holton back, but with Kuno Wittmer as his teammate. Automatic Racing has entered a third car for the race after running two at the Roar. The third entry, No. 97, is a new 2019 Aston Martin Vantage GT4, which will be racing for the first time. Automatic Racing veterans Dr. Ramin Abdolvahabi, Rob Ecklin Jr. and Brandon Kidd will drive. For those of you who crave loud noises, the team’s previous generation Aston Martins (Nos. 09 and 99) are also entered. They are the loudest cars in Michelin Pilot Challenge. The TCR class is up from nine cars at the Roar to 14 for the race. KMW Engineering has both of their full-time Alfa Romeos present (they only had one at the Roar). LA Honda World Racing (LAP Motorsports) has entered three cars for the race after having two at the Roar. Having the third car brings some driver changes. Shelby Blackstock moves from the No. 73 to the No. 37 to team up with Tom O’Gorman. Mike LaMarra moves to the No. 73 to once again team up with Mat Pombo. The third entry (No. 52) will be shared by Colin Mullan (moved over from the No. 73) and Max Faulkner, who drove the only full-time Porsche Cayman in Street Tuner last season. Bryan Herta Autosport with Curb-Agajanian planned months to advance to skip the Roar. Just last week, their new mount, the Hyundai Veloster N TCR was unveiled at the North American International Auto Show in Detroit. 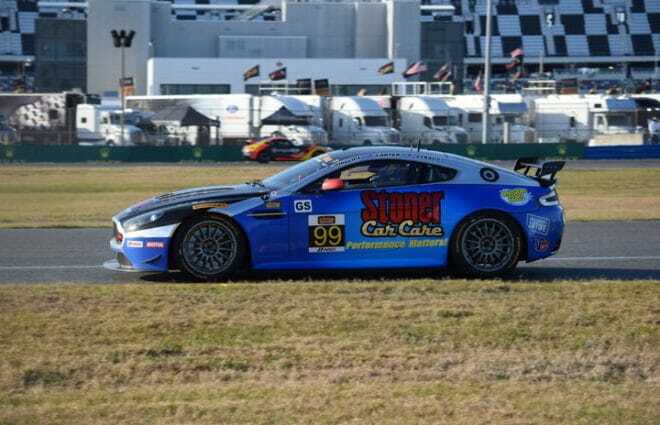 Two cars will be present in Daytona, one for Mason Filippi and Harry Gottsacker (No. 21) and another for Michael Lewis and Mark Wilkins (No. 98). Lewis and Wilkins drove full-time for the team in Pirelli World Challenge’s TCR class while Filippi split his time between Winding Road Racing TFB and RealTime Racing. Gottsacker drove in Pirelli World Challenge’s GTS class. Finally, a new team, Fast MD Racing, is fielding an Audi RS3 LMS Club Sport this weekend. 2018 Street Tuner champ Nick Galante is joined by James Vance and Jared Salinsky, most recently (in IMSA) of LAP Motorsports. Vance returns to the series after spending 2018 running part-time in the Pinty’s Series. The season opening four-hour race for the Michelin Pilot Challenge is scheduled to go green at 12:15 p.m. EST Friday (Jan. 25). The race will be streamed live at IMSA.com and FansChoice.tv. Frontstretch will be on-site in Daytona to bring you in-depth coverage.